The famous circus master was also one of the most devoted Universalists in the nineteenth century. 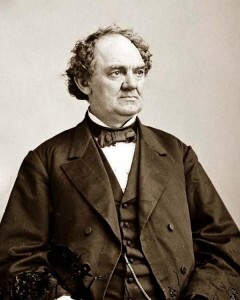 Barnum was born on July 5, 1810 in Bethel, Connecticut into a family of entrepreneurs. His father was a tailor who also ran a tavern, a freight service and a livery stable. He died when “Taylor” was only 15, leaving the family insolvent, although his childhood poverty was greatly exaggerated in the autobiography Barnum published in 1854-1855 (The Life of P.T. Barnum, Written by Himself). Barnum was named for his maternal grandfather, a practical joker who also introduced the boy to Universalism. Brought up Congregationalist, Barnum became a Universalist about 1824, when neighboring Danbury called its first settled Universalist minister. Apparently, Barnum was clerk of the society at one time. At the age of 16 he moved to New York, and was a store clerk and purchasing agent. A little more than two years later, he was married to Charity Hallet on November 8, 1829. Upon his return to Bethel, he began to write editorial letters to the paper about the separation of church and state. When they would not publish his letters, Barnum started up a rival paper, The Herald of Freedom. The paper carried a series on the “Proofs of Universalism.” During his editorship he was sued for libel, and found that his own testimony was inadmissible because he was a Universalist, and therefore not accountable to God. He was convicted and served two months in jail. He returned to New York and launched his career as a showman touring with jugglers, minstrels and various human “oddities.” Barnum freely admitted that much of his show was based on elaborate hoaxes; he distinguished himself from persons who would not to admit to their own fraud (he spent a lot of time and money in pursuit of fake spiritualists). One of the famous “oddities” in Barnum’s show was Joice Heth, whom he represented as the 161-year-old African American “mammy” of George Washington. Heth was in fact an eighty-year old enslaved woman that Barnum had purchased from another showman, made to look more elderly. He once bragged in print about how he exploted Heth’s weakness for whisky in order to extract her teeth so that she would look older. Heth was made an object of spectacle even at her death; Barnum had her dissected in public, in a pseudo-scientific display intended to dramatize the otherness of the black body. Other humans on display included an “African Giantess,” the black conjoined twins Millie-Christine, “wild men of Borneo,” and a 25-inch dwarf who like many of Barnum’s oddities was just a child when essentially indentured to the show. Barnum’s own autobiography paints a complicated picture, as he charts both his ardent advocacy for the abolition of slavery and describes Africans as underdeveloped, requiring the context of the civilized west to flourish. He also claimed that many of his shows using racist stereotypes were actual parodies of phrenologists and others who would use pseudo-science to argue for the inferiority of any race. A major turning point in his career occurred in 1841 when the American Museum went up for sale, and Barnum was able to purchase it. The Museum was a five-story building that provided a permanent home for Barnum’s old show, also housing an ever-expanding collection of natural wonders and curiosities, including America’s first public aquarium. Barnum also used the venue for pro-Temperance theater pieces (he personally restrained from alcohol his whole life). During this time, Barnum became an active participant in the Fourth Universalist Society in New York, and especially friendly with its minister Edwin H. Chapin. The two men were seen together so much that they were compared to the famous Chinese Siamese Twins, Chang and Eng, who were part of Barnum’s exhibitions. After Chapin’s death, Barnum began to attend Unitarian services given by Robert Collyer. Barnum was most committed to the First Universalist Society in Bridgeport, Connecticut. After 1848, he was the greatest financial contributor to that church by far, and also donated enormous sums for various building projects. He left the church a sum in his will that became known as the Barnum Fund. Olympia Brown was his minister from 1869 to 1875. He was very supportive of her work, and often, she said, complimented her preaching, but her women’s rights advocacy led to a schism and her early dismissal. It was during this time that he emerged from a retirement brought on by fires at the American Museum. He also spent two terms in the Connecticut legislature, where he was most known for advocating for African American suffrage on the basis of the equality “of all immortal souls,” and also, in 1879, passing a bill prohibiting the sale of contraception. Another minister who became Barnum’s friend was Elmer Capen, the third president of Tufts College. Barnum served on the board of trustees there from 1851-1857 and, with Capen’s encouragement, endowed and built the Barnum Museum of Natural History, which opened in 1884. He often gave the museum mounted animal hides from deceased circus animals, including the elephant Jumbo, who became the Tufts mascot. Barnum also gave money to a number of other Universalist schools and groups around the country. Near the end of his life he published the best selling pamphlet, Why I am a Universalist. It had a wide readership, remained in print for many years, and so enthralled George Perin, missionary to Japan, that it became the first Universalist tract translated into Japanese. In it Barnum postulated that death does not end character development, but that the soul continues to develop in the world to come. By the time of his death 60,000 copies were in circulation. Barnum died on April 7, 1891, and the funeral was conducted on the 10th by Collyer and his Universalist pastor from Bridgeport, Lewis B. Fisher. 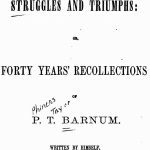 Read Barnum’s best selling pamphlet, “Why I am a Universalist,” by clicking here.